WESTBROOK — Streetlights along Main Street’s downtown corridor may soon be upgraded to match the style of those in other parts of the city. On Monday, the City Council took the first step toward that initiative by approving at first reading a $25,000 bid award for Wright-Pierce, a Portland engineering firm, to redesign the lights and the accompanying electrical system along Main Street, as well as in the municipal parking lots off Ash, Church and Mechanic streets. The installation of new lights is estimated at $600,000. Councilor Victor Chau said that $25,000 would be better spent actually buying new lights rather than just a design. If “the $25,000 would do it all, maybe yes, but we aren’t changing one light bulb we are just getting a piece of paper for that $25,000,” he said at a committee of the whole meeting prior to the council meeting. When it came time to vote, however, Chau ultimately joined his fellow councilors in supporting the idea. There are 88 streetlights on the list to be replaced. According to Wright-Pierce, the final design of the streetlights will be completed by the end of the year. “They are old and incredibly inefficient because they are 1970s technology. We’ve been looking to replace them for awhile now,” Bryant said. Councilor Anna Turcotte said she was concerned about the reliability of the lights. The new lights would be more reliable than the existing lights, which Bryant said “are out on a reoccurring basis.” City Engineer and Director of Public Services Eric Dudley said the city currently owns the light poles, but Central Maine Power owns the light heads and is responsible for upkeep and replacing them with they burn out. Generally, he said, CMP is responsive when it comes to replacing bulbs. “For the most part, it is usually within a week to two weeks for the light bulbs to be changed. Sometimes it is faster,” he said. With the new light poles, the city would own the bulbs as well and be responsible for maintenance. 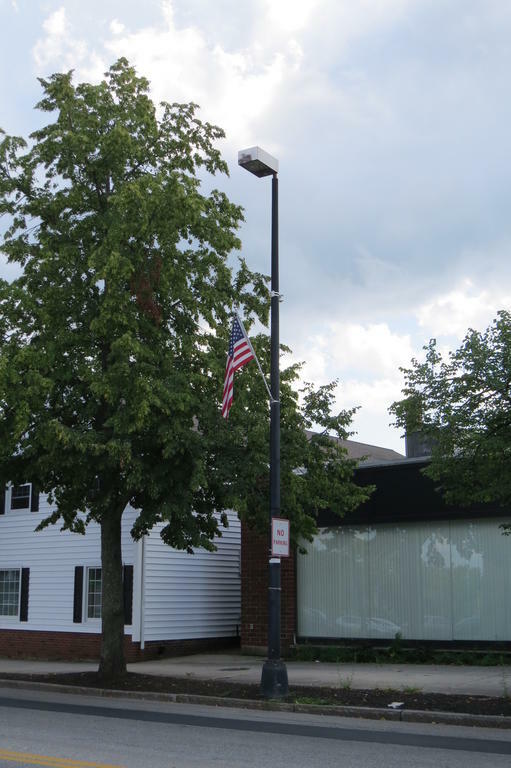 Aesthetics is the main reason the Discover Downtown Westbrook board unanimously voted to support the light pole upgrade. No funding has been set aside to install the new lights once the design is complete. Dudley said he does not have an exact cost, but estimated installation could cost around $600,000. Councilor Gary Rairdon asked whether some of the cost could be paid for through grants. Dudley said as of right now he is not pursuing any grants to cover the cost because the exact amount isn’t known. Council Vice President John O’Hara said the $600,000 pricetag to bring LED technology to the Main Street corridor is a “wonderful bargain for this community in the long run,” considering the maintenance and operational cost savings. LED bulbs, he said, don’t need to be replaced as frequently and other electrical components, such as ballasts, don’t need to be purchased. O’Hara said his employer, the Portland International Jetport, is jumping into LED lights “head first.” Coming off a project to put LED lights in 500 fixtures in the terminal, O’Hara is working to put the technology in the 50 rooftop lights in the parking garage. LEDs are already used for runway lights, taxiway lights and ramp lights. The airport parking lot lighting upgrade, he said, is expected to save $300,000 a year in lighting costs assuming the 50 lights are on 10 hours a day, seven days a week. “I’ll take that return any day, and that’s what we should be striving for in this community,” O’Hara said. 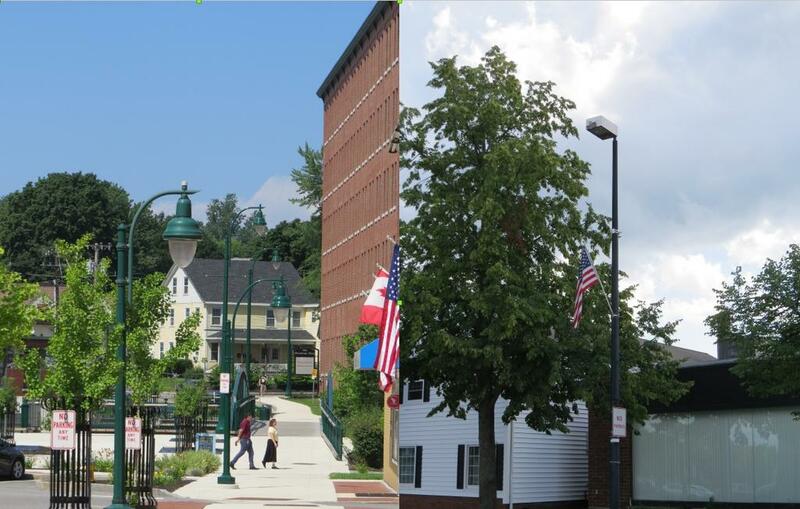 The streetlights near Westbrook’s Bridge Street pedestrian bridge, above, and along William Clarke Drive are the inspiration for a initiative to replace the 1970s streetlights that dot Main Street and the municipal parking lots. The city is looking to replace more than 80 streelights along the Main Street corridor with a newer design and more efficient lights.